Electro Metal Pressings (Pvt) Ltd was recognised for commitment to quality, leadership, technology and innovation by the Business Initiative Directions. 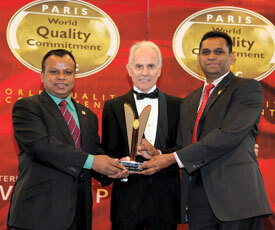 (BID) World Quality commitment convention and the presentation of 2011 - International Quality Awards which took place on October 24, in this Paris Concorde La Fayette Hotel. The event was presided over by Jose E. Prieto, President and CEO along with outstanding personalities from the Business World and Diplomatic Corps. BID is a leading private organisation awarding companies worldwide. In the past years BID Awards have contributed advantages to companies awarded at their conventions in media attention and technical advantages of quality implementation. BID has awarded the World Quality Commitment in the Gold Category to Electro Metal Pressings, On the basis of voting process carried out among the all participating former awardees. The result of the voting process is confidential in that the exact source of nomination of the company cannot be revealed. The final decision to award the company made by the WQC selection committee is based on the criteria of the principles of QC 100 Total Quality Management (TQM).